If there’s supposed to be a stigma attached to living with mom and dad through one’s late twenties or early thirties, today’s “boomerang generation” didn’t get that memo. Among the three-in-ten young adults ages 25 to 34 (29%) who’ve been in that situation during the rough economy of recent years, large majorities say they’re satisfied with their living arrangements (78%) and upbeat about their future finances (77%). The sharing of family finances appears to have benefited some young adults as well as their parents; 48% of boomerang children report that they have paid rent to their parents and 89% say they have helped with household expenses. As for the effect on family dynamics, about quarter (25%) say the living arrangement has been bad for their relationship with their parents, while a quarter (24%) say it’s been good and nearly half (48%) say it hasn’t made a difference. To be sure, most young adults who find themselves under the same roof with mom and dad aren’t exactly living the high life. Nearly eight-in-ten (78%) of these 25- to 34-year-olds say they don’t currently have enough money to lead the kind of life they want, compared with 55% of their same-aged peers who aren’t living with their parents. Even so, large majorities of both groups (77% versus 90%) say they either have enough money now to lead the kind of life they want or expect they will in the future. One reason young adults who are living with their parents may be relatively upbeat about their situation is that this has become such a widespread phenomenon. Among adults ages 25 to 34, 61% say they have friends or family members who have moved back in with their parents over the past few years because of economic conditions. Furthermore, three-in-ten parents of adult children (29%) report that a child of theirs has moved back in with them in the past few years because of the economy. These findings are based on a new Pew Research Center survey of 2,048 adults nationwide conducted Dec. 6-19, 2011, that explores the family dynamics and economics of multi-generational living at a time when the number of multi-generational family households in the country continues to rise. A Pew Research analysis of Census Bureau data shows that the share of Americans living in multi-generational family households is the highest it has been since the 1950s, having increased significantly in the past five years. Adults ages 25 to 34 are among the most likely to be living in multi-generational households: In 2010, 21.6% lived in this type of household, up from 15.8% in 2000 (the vast majority were living with their parents). 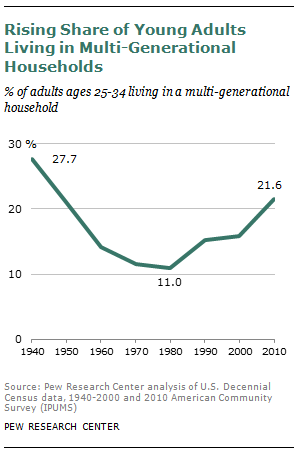 The share of 25- to 34-year-olds living in multi-generational households was at its lowest in 1980 (11%) and has risen steadily since then, spiking upward since the recession started in 2007. In some cases, the economics of multi-generational households can be beneficial for both adult children and their parents. While many young adults help defray their parents’ household expenses, living with mom and dad can also be a financial lifeline. In 2010, the poverty rate for young adults ages 25 to 34 who lived in multi-generational households was 9.8%. This compared with a poverty rate of 17.4% among young adults living in other households. Since the onset of the recession, the economic backdrop for young adults has been bleak. The unemployment rate for the youngest workers (those ages 18 to 24) soared from 2007 to 2010 and has only come down slightly over the past year. Adults in their late 20s and early 30s have fared somewhat better in the labor market, but they have felt the sting of tough economic times in other areas of their lives. Many have had to settle for jobs they didn’t really want just to make ends meet. Fully a third have gone back to school, and an equal share (34%) have postponed either marriage, parenthood or both. All of this economic upheaval appears to begiving rise to a protracted set of economic ties between parents and their adult children. 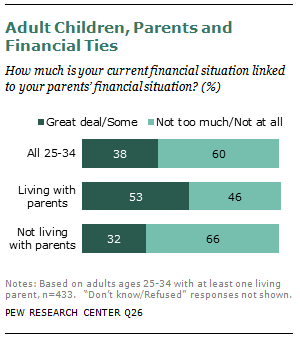 Among all adults ages 25 to 34, nearly four-in-ten (38%) say their current financial situation is linked to their parents’ financial situation. Some 18% say it is linked “a great deal” and 19% say it is linked “some.” The remaining 25- to 34-year-olds describe the extent to which their current financial situation is linked to their parents as “not too much” (20%) or “not at all” (41%). Not surprisingly, young adults who are living at home see a stronger linkage between their finances and those of their parents. Among those ages 25 to 34 who live with their parents now or moved back in temporarily in recent years, 53% say there is a great deal or some connection between their financial situation and their parents’. This compares with only 32% of young adults who are not living with their parents. For the most part, young adults who say their financial situation is linked to their parents’ see this as a benefit rather than a burden. Among 25- to 34-year-olds 72% say their parents’ financial situation has had a positive impact on their own financial situation. Only 25% say it has had a negative impact. In spite of the connection they see between their finances and their parents’, relatively few young adults say they receive direct financial assistance on a regular basis from their parents or other family members. Among adults ages 25 to 34, only 8% say they regularly receive money or financial assistance from their family. The share is significantly higher for adults ages 18 to 24 (34%). In addition, young adults who are enrolled in school are more highly dependent on their parents for financial support (31% receive regular financial help) than are those who are not enrolled (12%). While much of this report looks at 25- to 34-year-olds, it also includes analysis of a broader universe of young adults—those ages 18 to 34. This provides a larger sample size and allows for deeper demographic analysis among young adults. There is little variation in young adults’ living arrangements by gender or race. Among those ages 18 to 34, men (40%) are just as likely as women (38%) to live with their parents now or to have moved back home temporarily. Similarly, there is no significant difference in the share of young whites (38%) and young blacks (32%) who have lived with their parents in recent years. Young Hispanics are slightly more likely to have lived with the parents (45%), although this difference is not statistically significant. Educational attainment is linked to living arrangements only for young adults in their early 30s. Among adults ages 30 to 34, those without a college degree are twice as likely as those who have graduated from college to be living with or have moved back in with their parents (22% vs. 10%). Among those younger than 30, educational attainment is not correlated with living arrangements. Young adults who are not employed are more likely than those who are working to be living with their parents or to have moved back home temporarily in recent years. Among 18- to 34-year-olds who are not employed, nearly half (48%) have lived with their parents. This compares with only 30% of those who are employed full time. The youngest adults—those ages 18 to 34—who are living at home (or moved back in temporarily in recent years) have a much more positive view than those in their late 20s and early 30s on how this has affected their relationship with their parents. Fully 41% of 18- to 24-year-olds say living with their parents at this stage of life has been good for their relationship, while only 12% say it’s been bad for the relationship. The 18- to 24-year-olds who have lived with their parents are much less likely than 25- to 34-year-olds to say moving back home was an economic necessity. Parents who say an adult child of theirs has moved back home in recent years because of economic conditions are just as satisfied with their family life and housing situation as are those parents whose adult children have not moved back home. Census data show that during the recession years (2007-2009) the share of Americans living in multi-generational households increased more among adults ages 25 to 34 than among any other age group. Who are the Boomerang Kids?